You have found Navarre Beach, a small community located in south Santa Rosa County in the Northwest Florida Panhandle. The city is about 25 miles east of Pensacola and about 15 miles west of Fort Walton Beach. Also Navarre is located near several large military facilities. Naval Air Station Pensacola to the west, Hurlburt Field and Eglin Air Force Base to the east. While Navarre is on the junction of US Route 98 and State Road 87, it is known for the natural beauty and unspoiled white beaches. Yet swimming in the emerald colored water, having a picnic on the beach, fishing, and riding or jogging on the several scenic bike paths or 12 miles of beaches are just some of the activities available. Browse all the Navarre Florida real estate listings available and call me if you have questions or want to view a property 850-499-0778. Located in Navarre, this 4 bedroom 2 bathroom home offers an open-split floor plan and vaulted ceilings giving to a nice spacious feel. You'll enjoy two separate dining spaces, a breakfast bar and a pantry. The master suite offers his-and-hers closets, double vanity, water closet, separate shower and garden soaking tub. Gulf Breeze Proper is one of the most sought-after locations in Gulf Breeze, due to the proximity and the short walking distance to the neighboring recreational center, fabulous K-12 school system and the ease of access to the Gulf and Santa Rosa Sound. There is no better way to enjoy the area than in a home that has been lovingly taken care of by the original family. A meticulously maintained 3 bedrooms, 2 baths - 1692 sf home in desirable Shadow Lakes that's ready for quick occupancy. All appliances stay with home and that includes the refrigerator, washer and dryer. Some furniture is negotiable. This is the home you've been waiting to see! Nestled on one of the most desirable streets in Tiger Point Village you will find this 2 story Beauty awaiting its new family. This home has been well maintained and loved. You will find many upgrades and updates including: new hardeeplank siding, new windows, Hurricane clips, new garage door, and a transferrable termite bond. Beautiful inside and out. Well maintained and pride of ownership is apparent from the minute you drive up to this lovely home. Fabulous open floor plan featuring a flowing Family room with high ceiling, French doors to screened lanai with easy access to all other areas of the home. Formal Dining room with built-in hutch, beautiful glass door cabinets and beverage cooler. Welcome home! Awesome home centrally located between Navarre and Hurlburt Field. Totally updated inside! Great sized living room that opens to the dining room and kitchen. Beautiful granite counters in the kitchen. Stainless appliances. No carpet in the house! Split floorplan with the master suite off the dining room and the other two bedrooms are off the living room. Minutes from Navarre Beach, a public boat launch, and Navarre High School, this Vilano Beach split floor plan boasts 4 bedrooms, 2.5 bathrooms, and a Flex Room which could be a quiet retreat, play room, or home office. The 10' ceilings, tall windows and open living area welcome you home. This home has been crafted for those who enjoy the finer things in life. Relax on your screened porch with friends while overlooking your large backyard and taking in the lush outlook over the neighboring green belt.A grand front entrance sets the tone for a home that is luxurious and spacious, offering open-plan living zones and soaring ceilings overhead. East Navarre location - faster access to bases and Fort Walton Beach and Destin. NEW ROOF 2019! New flooring 2019 to include luxury vinyl plank and carpet. New hot water heater. HUGE BACKYARD is large enough for a POOL. Buyer to verify all measurements. 2 main living areas can be used for living, dining, flex space - you choose how it works for you! Fireplace, separate laundry room. Nice home in quiet one street subdivision! Excellent open floor plan for dining, living and kitchen areas and split bedrooms. Main living areas have cathedral ceilings, wood burning fireplace and carpet. Large yard with privacy fence. Two car garage provides plentiful space for parking and/or storage. Commercial building on Navarre Parkway with 1840 SF on ground floor and 920 SF of storage on second floor level. Property is located on the south (water) side of Hwy 98 about 1/2 mile east of Navarre Beach bridge. Building has bath and 10' roll up garage door for rear storage. Close proximity to Navarre Beach with ideal visibility from busy Hwy 98. This custom-built home is situated on an over-sized corner lot and is surrounded by majestic oak and hickory trees. Perfect for entertaining, this home comes fully equipped with a screen-enclosed pool and a private lane offering additional parking. It has been meticulously-maintained by the original architect/owner who designed this home for his family 25 years ago. Find Navarre Florida real estate and Navarre Florida homes for sale. 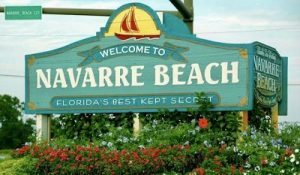 Search Navarre Florida real estate including houses, homes, condos, townhomes by price and location. Our MLS search pulls live data from the Emerald Coast MLS. This provides the most comprehensive and up to date property details like home prices, features and all the facts you need about Navarre Florida real estate. Rather look at what other Navarre real estate listings are available? Also search our listings for Navarre Open Houses, Navarre New Listings and Navarre Homes with Price Reductions now.